Hello! You came to the right place if you're looking for a fun, fun game! 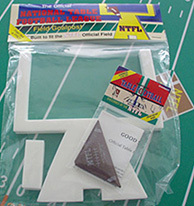 THE OFFICIAL National Table Football League Game. You will not find this ANYWHERE else! 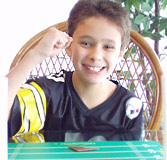 Based on the all time favorite "paper football" we all used to play...(who remembers how much fun that was!? )...now you and your friends can challenge each other to the real thing without the worries of your 'paper' football wearing out or finding the ultimate coffee table to play on! Made by GOOD SPORT(TM) with all new, quality materials. 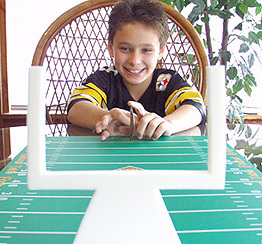 You'll slide the football up and down the field scoring touchdowns and field goals, just like the pros. Get ready for your friends to bug you every time they come over! It's really THAT much fun~~ and you won't find it any other place but here. We've had High Schools place these in their cafeterias and are a huge hit! Great gift for your church's Youth Group or local Community Center. 1 Football Field 24 inches X 16 inches. Flexible, yet strong (think heavy Mousepad material). 1 Goalpost Made of thick, dense foam. 2 Triangle Footballs Built to last! 1 Edger For those controversial close calls! The Official Rules of the Game Enclosed in Zip-loc plastic sleeves to keep your game organized. Shipping is $9.95 via Priority Mail I'm happy to combine shipping on multiple sets. Simply email me with your zip code for an exact quote. 4 Your item will be shipped within 36 hours of payment being received.